I first read JURASSIC PARK when I was 11 years old, and it has remained locked as one of my favorite novels of all time for 15 years. But it has existed and thrived on memory alone; I hadn’t returned to Crichton’s standout work until very recently. And I’m thrilled to announce it has withstood the test of time. JURASSIC PARK remains a definitive, must-read thriller. The founder and chief executive of InGen, John Hammond, invites palaeontologist Alan Grant and his colleague Ellie Sattler – among others, including Hammond’s two grandchildren, and the vitriolic mathematician Ian Malcom – on a tour of Jurassic Park; but the systems and precautions that were designed to keep visitors safe, and the animal population controlled, quickly begin to fail because of industrial espionage – and those trapped on the island are faced with the impossible task of surviving a night on an island populated by free-roaming dinosaurs. While several of the characters exist as mouthpieces to lament or applaud scientific advancements, the core cast – Grant and the two grandchildren especially – are fleshed out enough to spark genuine empathy. The action is taut, punctuated with moments that have resonated with me since childhood: specifically when the dinosaurs escape, and our heroes are trapped in their Land Cruisers as a tyrannosaurus rex looms impossibly large… These are moments Spielberg captured in his film adaptation, but are better imagined in the mind’s eye. And while the film limited the brutality of the violence – it was hinted at rather than shown – Crichton doesn’t hold back; JURASSIC PARK is not a gory novel, but when a dinosaur plunges its teeth into flesh he doesn’t shy away from the vicious truth of such an experience. 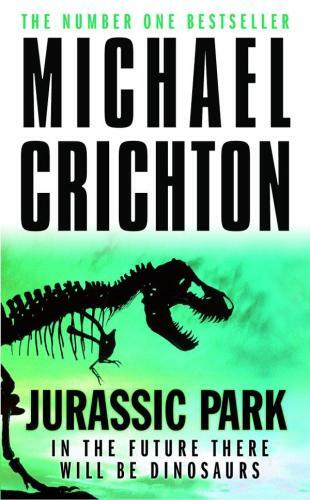 Twenty-four years have passed since JURASSIC PARK was published, but Crichton’s fears about genetic research and its potential consequences ring true to this day, particularly as we continue to advance in this area. While one could view the novel as an exaggerated premonition of the future, I prefer to reflect on JURASSIC PARK exclusively as a piece of entertainment; and viewed as such, it’s fantastic, and essential reading.